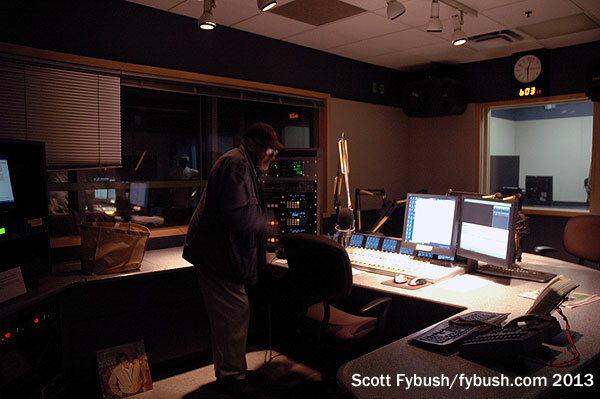 And on the north side of town, at Temple University, WRTI (90.1) is Philadelphia’s home for both jazz and classical programming. 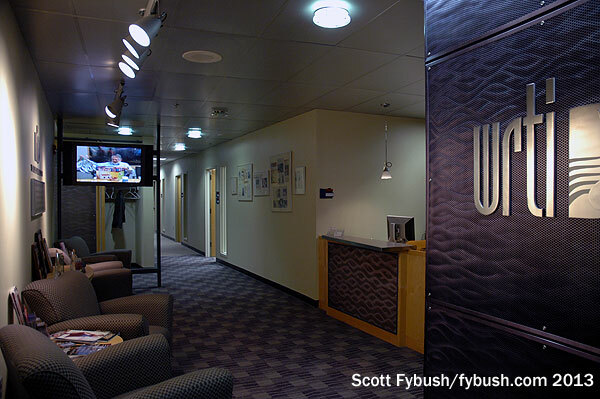 It’s been at its current home in a university office building on Cecil B. Moore Avenue since 2004 – and what a home it is! Let’s take a late-night tour, shall we? 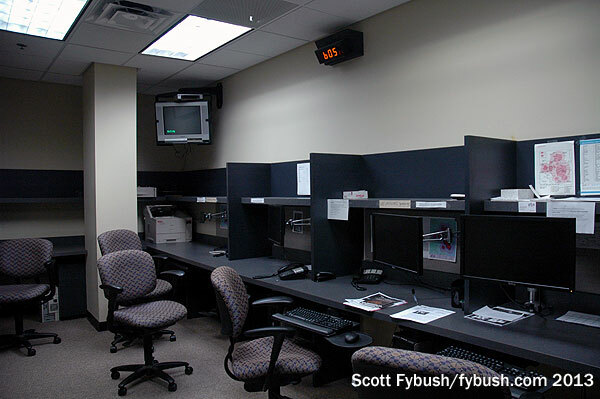 While WRTI isn’t primarily a news/talk station, there’s still a good-sized newsroom down the hall here, along with a studio where talk programming can be originated. 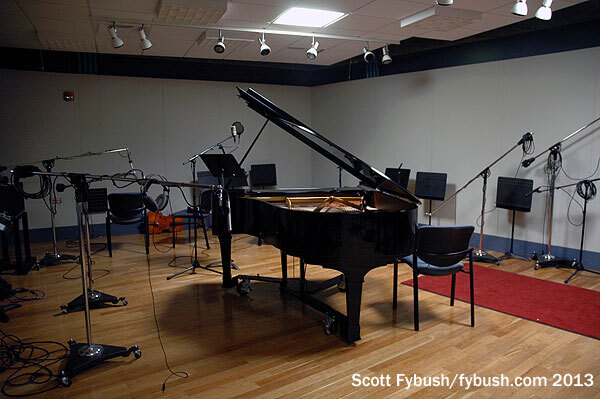 Around the corner, there are still more production rooms – and a big recording studio, too, that can be used for live music. 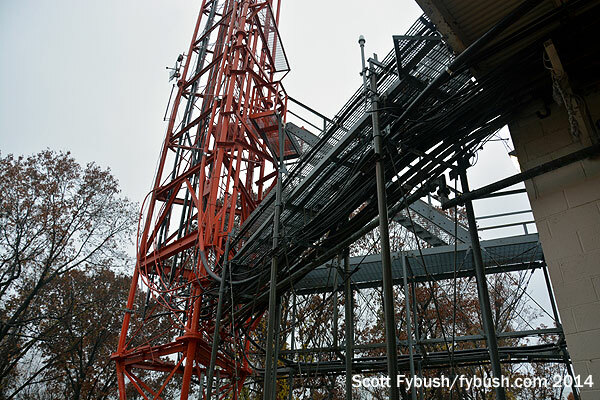 How about a transmitter site, too? 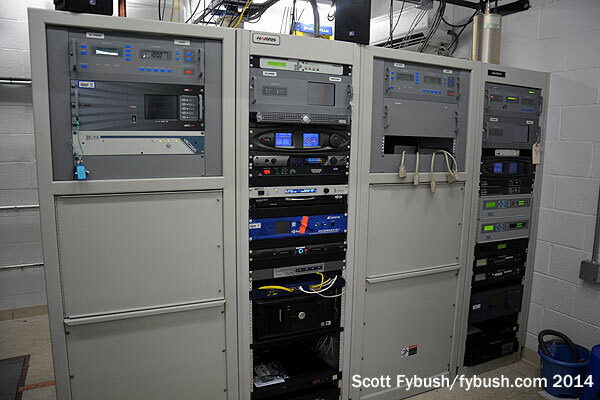 The bottom of the FM dial in Philadelphia has long been a complicated place, thanks to WPVI (Channel 6) operating just below the FM dial from the Roxborough tower farm. 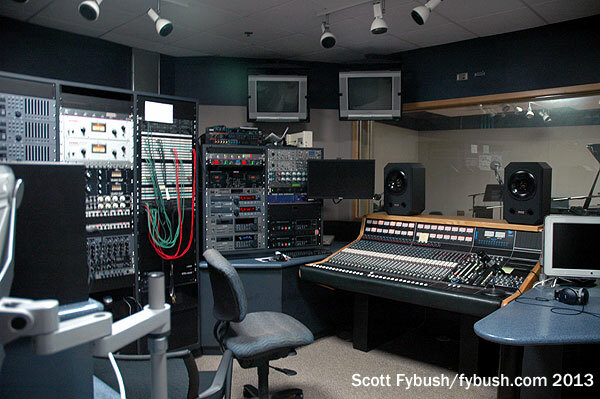 Philadelphia’s noncommercial FMs had to stay close to channel 6 to avoid interference – which has often meant operating right from channel 6’s own site. 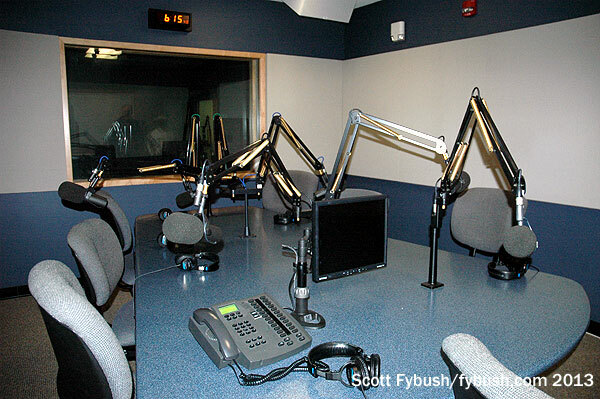 For many years, WRTI operated from the WFLN (95.7) tower just west of the WPVI site. It later moved a bit east to the “Gross Tower” at the southeastern edge of the Roxborough farm, and recently relocated to the new American Tower facility at the old WCAU-TV location on Domino Lane. Meanwhile, WRTI’s old home at the Gross Tower has a new occupant as of the summer of 2014: WXPN (88.5), which had been operating from another tower on the the WPVI property, moved to a new five-bay antenna right at the very top of the Gross Tower, mounted on the pylon that used to be the analog antenna of WPSG (Channel 57), above the two-bay antenna used by Greater Media’s stations. 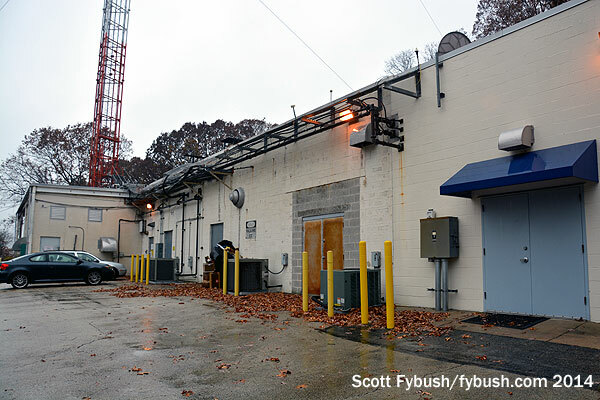 On a dreadfully rainy November day, we got a peek at WXPN’s new installation, tucked neatly in what used to be the transformer vault of the channel 57 transmitter plant. 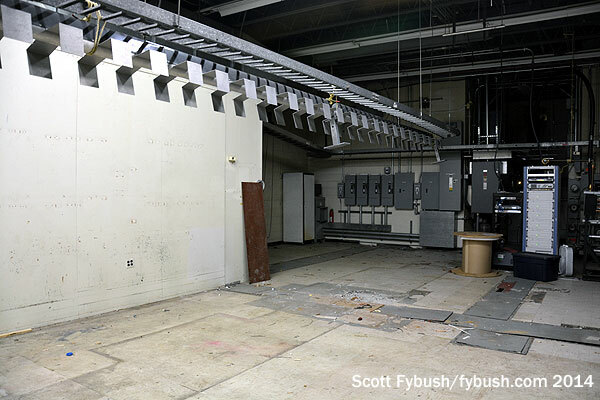 The old analog transmitter is gone now, leaving a big empty space with just one lonely LPTV transmitter at the far end; WPSG’s new digital operation is up Domino Lane at the new American Tower site. Thanks to Mark Humphrey and WRTI’s Tobias Poole for the tours! And don’t miss a big batch of Philadelphia IDs next Wednesday, over at our sister site, TopHour.com! In the late 70s and early 80s, WRTI was on the old WFLN tower, north of the tower farm, on Ridge Avenue. 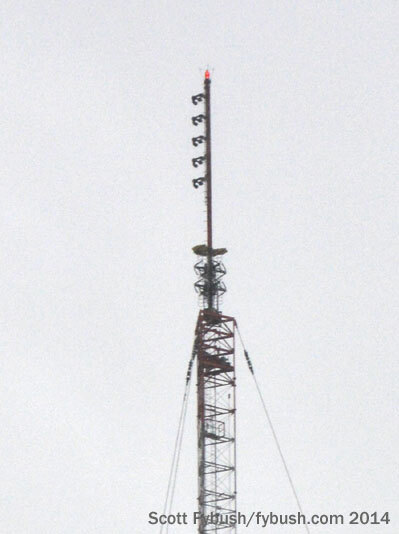 If they were on the old Channel 6 tower, it was probably after that, when they went to 20kw. It was fairly late in the evening and almost nobody was around except Tobias. I’ll catch you next time for sure! !